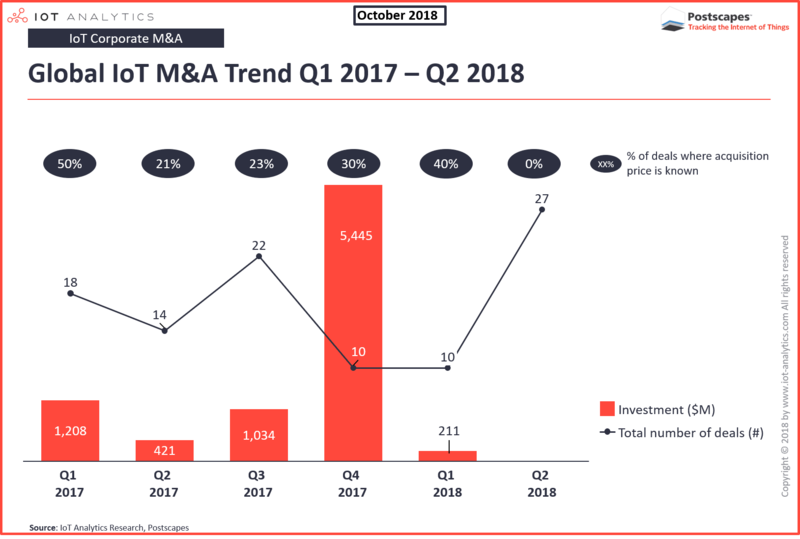 The recently released IoT Investments & M&A Report 2018 shows that overall IoT funding has stabilized at healthy levels. The last 12 months saw $3.3B in total recorded IoT investments. At the same time, successful exits such as Relayr’s recent $300M acquisition by MunichRe are increasing. The total number of acquisitions/exits saw a new record in Q2/2018 (27 in total). There are currently approximately 100 recorded IoT funding rounds per quarter. 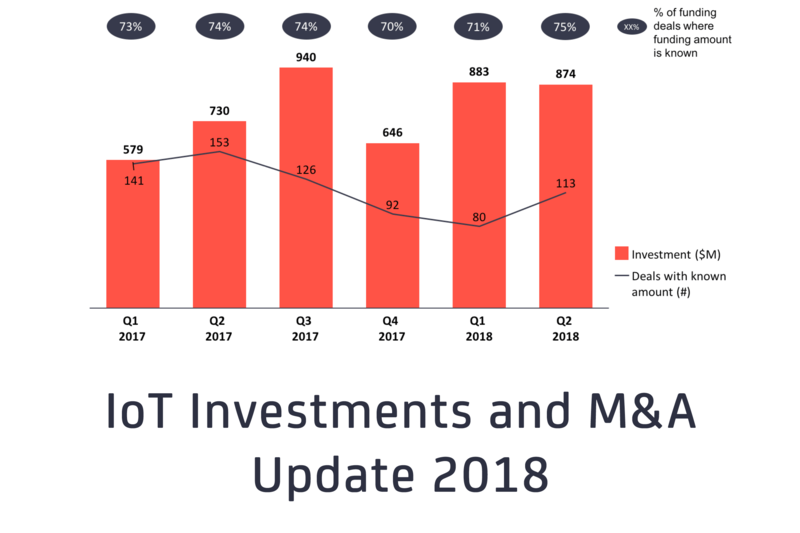 Q2/2018 total recorded IoT investments volume was $874M. IoT is now past the hype. 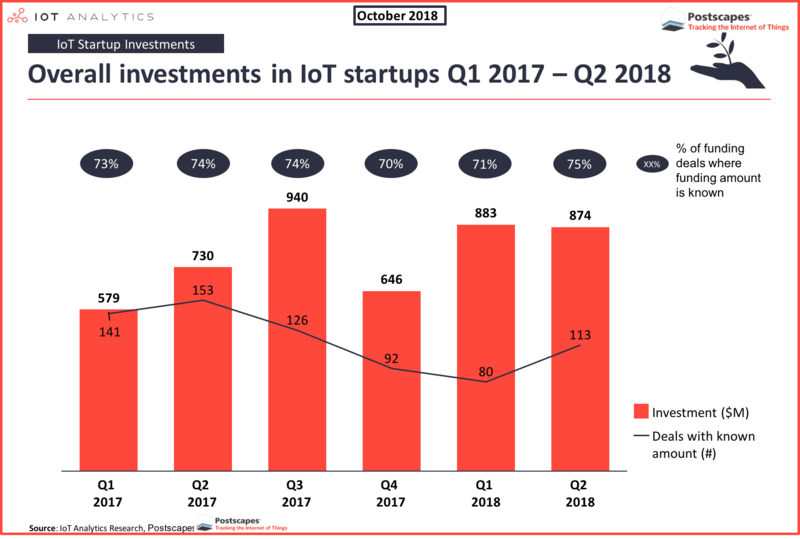 The numbers indicate that the volume has stabilized in the last 2 years with Q2/2018 showing a 1% IoT investments decrease from Q1/2018 and a 20% IoT investments increase year-on-year. The data is yet another indication that IoT has passed the hype stage. The continuous inflow of money and recent successful exits (see below) show that the value of IoT investments is real. IoT investments are significantly lower than Blockchain investments. It is worth noting that the total recorded value in IoT startup investments for the last 12 months ($3.3B) was only a fraction compared to the total amount raised for blockchain startups in the same timeframe. In Q1/2018 alone, blockchain startups raised $4B via ICOs according to KPMG. For the purpose of this report, IoT investments were divided into the 6 IoT tech stack elements: Hardware, Connectivity, Storage & Platforms, Analytics, Applications, Security. Although most funding still happens in hardware, there are examples of successful startups all across the stack. The below picture shows some recent startups such as IoT Platform C3IoT or IoT Connectivity specialist Actility for each tech stack layer. The full report is available to corporate IoT Analytics Research Subscribers. There are currently approximately 69 recorded IoT mergers & acquisitions per year. For the majority of these acquisitions, the sale price is not disclosed. Q2/2018 specifically saw a new record with 27 deals. IoT exits and acquisitions surge. The data indicates that exits are sharply on the rise (in Q2/2018). One should consider that the concept of IoT only started to gain widespread popularity around 2013/2014 and investors often have a 5+ year investment cycle. It is therefore expected that there will be more exits and acquisitions in the coming months. Some of the notable recent acquisitions include IoT networking solution specialist, Silver Spring Networks by Itron, French security-specialist Gemalto by Thales Group, and IoT Platform Relayr by MunichRe. IoT Analytics asked IoT investors who are part of the IoT Analytics Enterprise Technology Panel about their sentiment and outlook for the IoT investments space. Positive Outlook. All investors rated the outlook as either “stable” (33%) or expect an increase in IoT investments in the coming 12 months (67%). Difficult to find attractive startups. The one challenge that became apparent: It is not easy to find attractive IoT startups. Among the challenges, investors cited that many IoT startups fail to show a substantial recurring revenue stream. Although some startups make several millions of dollars in revenue, the revenue is often based on project-based consulting fees or through the support of one-time proof of concept (PoC) implementations rather than highly scalable software. The insights presented above are an excerpt of the 38-page IoT Investments & M&A Report 2018 that is available to corporate IoT Analytics Research Subscribers. Which companies have received the highest funding in the IoT space? How have funding amounts developed in the past quarters (by investment type, IoT tech stack, and investment round)? Which were the biggest recent acquisitions in the IoT space? In which regions and segments have acquisitions taken place? What are some typical revenue multiples paid? 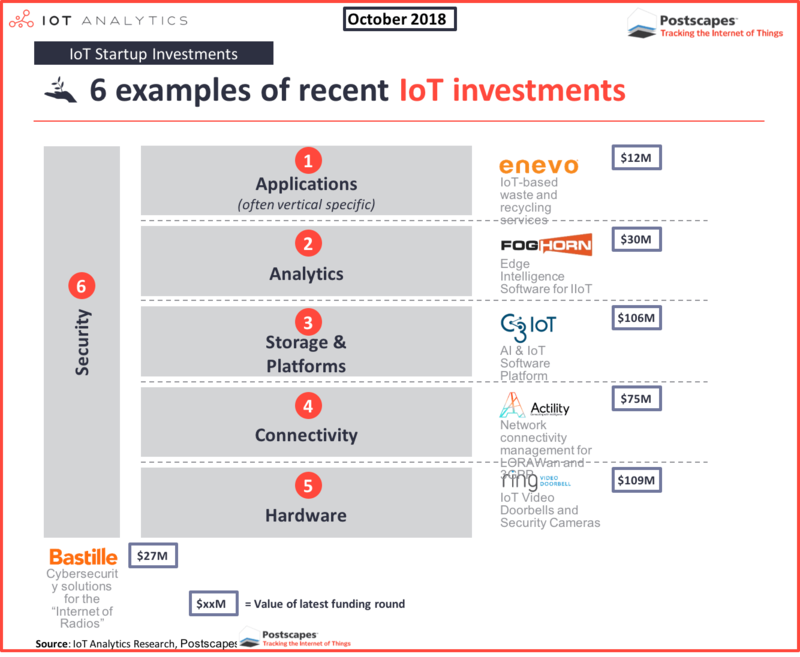 What is the IoT Analytics analyst opinion about selected highly funded startups and recent exits? 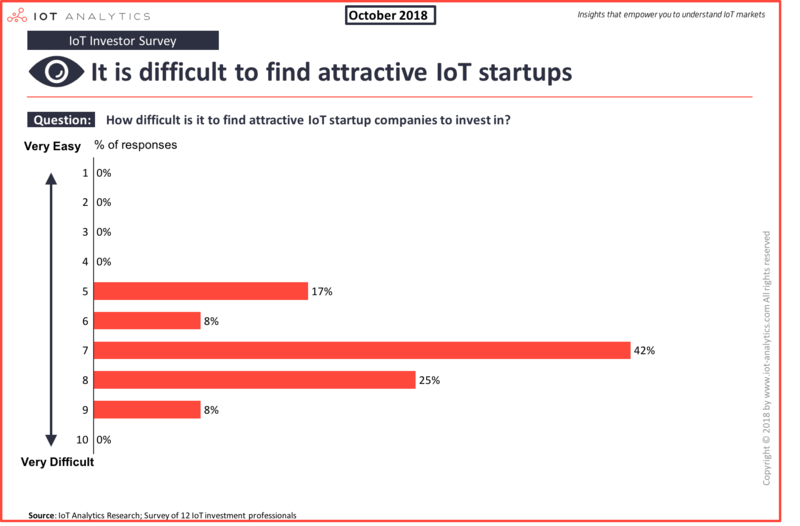 Which challenges do investors in IoT currently have and what IoT investment areas are they looking at in the coming months? What do investors think about the current IoT investment scene and its future outlook? The report is based on extensive research and comprehensive market analysis of data sets from January 2017 to June 2018 – mostly supplied by Postscapes. The purpose of the document is to inform interested parties of the state, growth and details of investments and M&A activity in the global IoT Market – through the IoT Analytics research lens. The data provided was validated and classified by IoT Analytics. 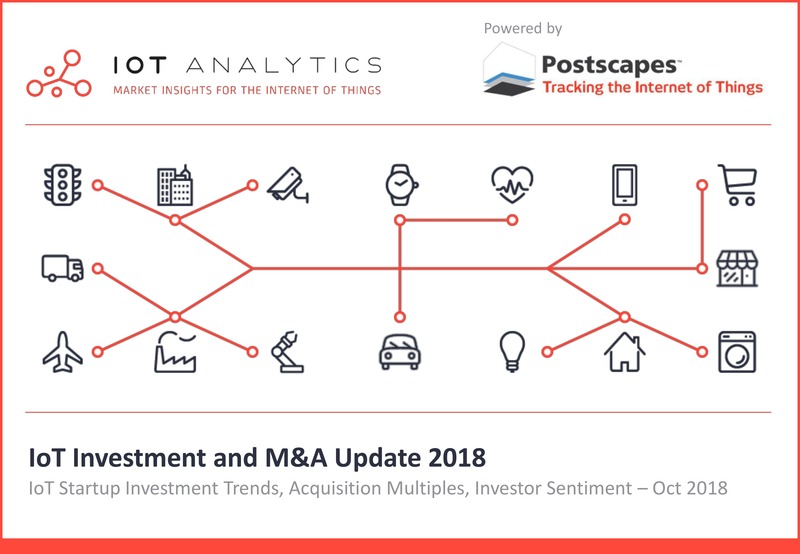 In addition to collaboration with Postscapes for data gathering, several questions were put to the IoT Analytics Research Panel of Technology Experts made up of investment and M&A industry experts to get their view and outlook on the IoT investment space.